While Delawana Resort remains a pet-free resort, we do have a permanent guest who roams the grounds freely and is friendly as can be... Her name is Gertie, and she is the Delawana Dog! Gertie belongs to resort manager Jordan. 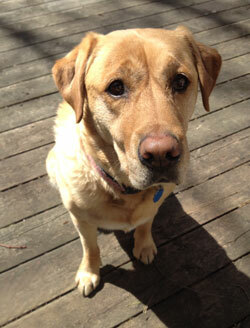 Gertie is a 11 year old yellow labrador retriever. She is great with children and adults alike. Be warned though, if you pay her too much attention, you may have a new best friend for the rest of your stay. Gertie loves to play ball and fetch frisbees, but unfortunately as she gets older she gets pretty sore after doing these activities. We ask that guests try to limit the throwing of balls, sticks, or frisbees for Gertie. All of our rooms and indoor facilities remain completely pet-free (and that includes Gertie, so please do not invite her in! ).